After a long flirtation with the village of Savoy, ALDI is ready to make a commitment: Savoy residents will soon have a new option for food shopping when bargain grocery chain ALDI opens its doors in late 2017. A Sold sign appeared earlier this week in this Savoy lot. No-frills grocer ALDI plans to open in the village in 2017, chambanamoms.com has learned. On Thursday, the company confirmed to chambanamoms.com its plans to open in Savoy next year. “We’re planning to open a Savoy, Illinois, store in late 2017, but we are still finalizing the details. At this time, we don’t have any updates to share, but we will follow up with additional information once available,” said ALDI Dwight Division Vice President Heather Moore in an email. Sources have told chambanamoms.com that ALDI is in the process of purchasing property in the Savoy Square retail area, which is located on Route 45 and Calvin Street. The area includes a Christie Clinic facility, a Chinese restaurant, salon, and a gas station. This website shows the area where the ALDI store will be located (see the part designated as under contract). The property was discussed this week at a Village of Savoy planning commission meeting on Monday and an approved replat went before the Village Board of Trustees on Wednesday. This isn’t the first time that ALDI has flirted with a Savoy location. The relationship started at least eight years ago, Helton said, when ALDI was rumored to be part of a planned complex at the corner of Dunlap and Curtis. CVS is the only retailer that has come to fruition there; an adjacent property was recently sold to Dr. Steve Jacob of SportsVet, who will relocate his practice there from nearby Savoy Plaza. ALDI has a long history in the Champaign-Urbana market. Before building its current Champaign location in front of Wal-Mart on North Prospect, ALDI was located off of Mattis south of Bradley. The northeast Urbana store, also situated near a Wal-Mart, opened in 2006. “Before choosing an ALDI location, we look at a variety of factors including population density, proximity to competition, cost of the property and traffic patterns. 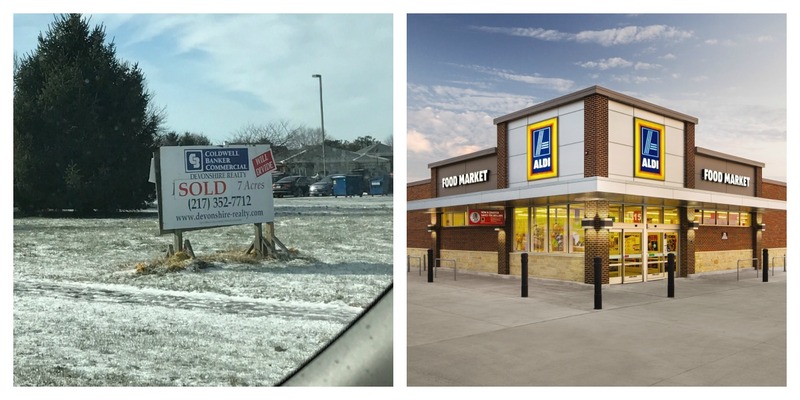 Additionally, since we already have a wonderful following of customers who shop at our two nearby stores in Champaign and Urbana, we wanted to continue to better serve the community by adding the new store in Savoy,” ALDI’s Moore said. Currently, Savoy has two other grocery stores in the village: Wal-Mart and Schnuck’s. ALDI’s fans love the chain’s no-frills shopping experience and saving money on speciality items including organic and gluten-free products. It is the closest thing Champaign-Urbana has to Trader Joe’s, as the two share a parent company.